The Ohio Elections Commission ruled the flyers were illegal because they did not say who created or paid for them. And that mystery is still unsolved. In the days before the election, three flyers were mailed or handed to prospective voters accusing Cranley of being "weak on crime" and "bad with the city's money." One also accused him of targeting black leaders and senior black women leaders in the community. The flyers were humiliating, Cranley said in an interview Friday. “To have to explain to my son when a mailer comes in the mail that’s calling his father a racist is incredibly devastating … with no facts behind it about who is paying for it,” Cranley said. Cranley won the election with 54 percent of the vote, beating then Councilwoman Yvette Simpson, who strongly denied any tie to the flyers. Both are Democrats. Despite his win, Cranley believes the flyers hurt him with African American voters at the polls. The red, black and white flyers appeared in voters' mailboxes and on Cincinnati street corners just days before the Nov. 7 election. 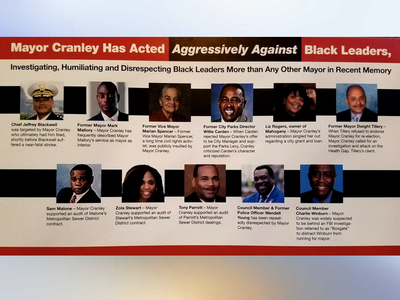 The full-color mailers criticized Cranley's financial leadership and claimed he has "acted aggressively against black leaders" such as ex-police chief Jeffrey Blackwell and Councilman Wendell Young. This anonymous flyer and two others criticizing Mayor John Cranley circulated the city in the days before the Nov. 7, 2017 election. 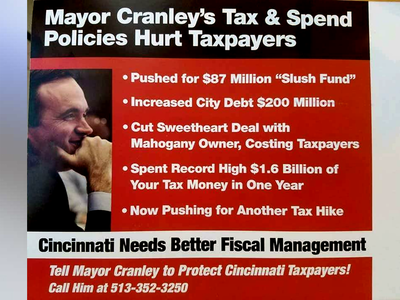 One of the three anti-Mayor John Cranley flyers. The Ohio Democratic Party filed a formal complaint with the state over the flyers in early November. Although the elections commission ruled the flyers were illegal and issued a fine, it could not determine who paid for them. “The case is essentially over at this point,” said Philip Richter, executive director of the Ohio Elections Commission. But Ohio Democratic Party Chairman David Pepper is vowing to still pursue the issue. An attorney for the party filed the complaint against Baise Quality Printing and Graphics in Columbus, which printed the mailers, and its owner, Troy Baise. The complaint also named Pierce Communications, a Columbus company that works on political campaigns. The complaint also named 10 others, listed as "John Doe," because it's still unknown who bought and created the ads. Richter said a new complaint could be filed if the state party ever determines who created and paid for the flyers. For now, the printing company and its owner, as well as the communications firm, must pay a combined fine of $300, or $100 for each of the three anonymous flyers, Richter said. Troy Baise, the owner of Baise Quality Printing and Graphics, did not return a call for comment. In November he told WCPO he simply printed and mailed the flyers. "Everything was already made," Baise told WCPO in November. "All I did was print it and mail it. He asked if he could use my permit. I've been in business for 30 years, my name is on the building, I've never had any problems." Baise said then that Pierce Communications made the purchase. Gene Pierce, the owner of the company, declined to comment on Friday. Pierce and Baise never responded to the elections commission about the complaint, Richter said. Pierce Communications does advertising work for Republicans across the state. Locally, it has worked on former City Councilman Charlie Winburn's campaign. He paid Pierce more than $67,000 in 2013 for ad work on his council re-election campaign, city records show. Winburn had "nothing to do with (the flyers)," his spokesman Jacob Hesseling said in November. Cranley still doesn’t know who was behind the flyers but he doesn't believe the fines are steep enough to prevent this from happening again. By state law, the maximum penalty the elections commission can issue for a violation like this is a $500 fine, Richter said. Amanda Seitz, Joe Rosemeyer and Kristin Swilley contributed to this report.